Candy LineEach camper receives a candy bar twice a week upon completion of his letter home... devious, huh?!!? Grundy UndyThe place where laundry is collected and distributed behind Logger 5. C.N.O.C.Our Campcraft/Wilderness Skills Program. Stands for “Camp Nebagamon Outdoor Center." Council FireImportant camp-wide assembly every Sunday night. 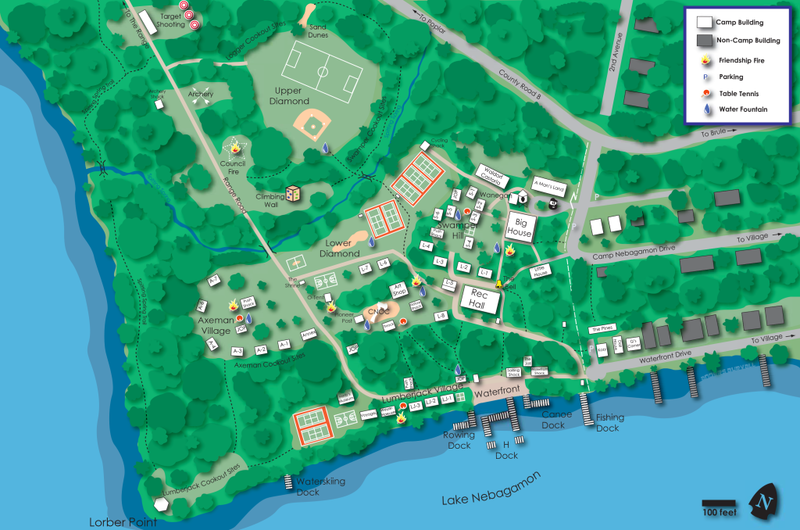 It’s the heart of camp; you’ll understand as soon as you experience it. Day PushThe camper in charge of ringing the bell for the day to keep all of camp on time. Horse ‘N‘ GoggleA random method for determining anything, from who wins an extra dessert to who does an extra job. Anyone will be glad to show you. M.O.C.A.Masters of the Culinary Arts. Our most popular project, the cooking project, most likely because of the eating after the cooking! K.P.Kitchen Patrol. The person who fetches food and clears the table. Campers take turns performing this responsibility. There is also an Assistant K.P. (A.K.P.) who stacks dishes for the K.P. to clear from table and sweeps the floor after the meal. Rinde BallRoof Ball. Named after long-time Push, Andy Rinde. Select from a variety of water sports, a host of land sports, climbing, target shooting, or many other options. Every morning you get to choose which activities you do that day. Hiking, canoeing, mountain biking and more. Whether it’s two nights or two weeks, there is a trip that will fit your interests. You can hike rugged Isle Royale in Michigan, paddle the pristine waterways of the Quetico in Canada, float the scenic Brule River in Wisconsin, and more; go wherever your curiosity takes you. Our summer schedule is packed with special events. Some of these are evening programs and some are all-day blow out events! To keep us all on our toes, each week we pepper the regular schedule with some special programs. This photo was taken on a Cruiser Day (Wednesdays), when our Logger Village staff hosted an “App Day” bringing popular apps like Temple Run to life and into the real world of our campers. Thanks for the past five years at camp. They have been the best of my life! Thank you so much! Thank you so much for everything you have done this year and the six previous years. It means so much to my brother and I. It has been such a wonderful experience and all of you have done a great job. I wish I could’ve spent more time with the camp family in the North Woods. Once again, thank you so much.